New Yorkers Catherine Greenman and Richard D’Albert spend weekends with their four children at the house, which is clad in Atlantic white cedar boards. In the playroom, a velvet Desiron sofa is set off by Down Pipe paint from Farrow & Ball. The white cedar board paneling in the interiors mimics the exterior; the ones inside are bleached for a lighter finish. Fixed glass picture windows are by Town & Country Glass. Unalam and JIG Design Build fabricated the staircase with ash risers on a single stringer, a Gray Organschi hallmark. The master bedroom’s fireplace boasts a black slate hearth set in white-painted masonry. 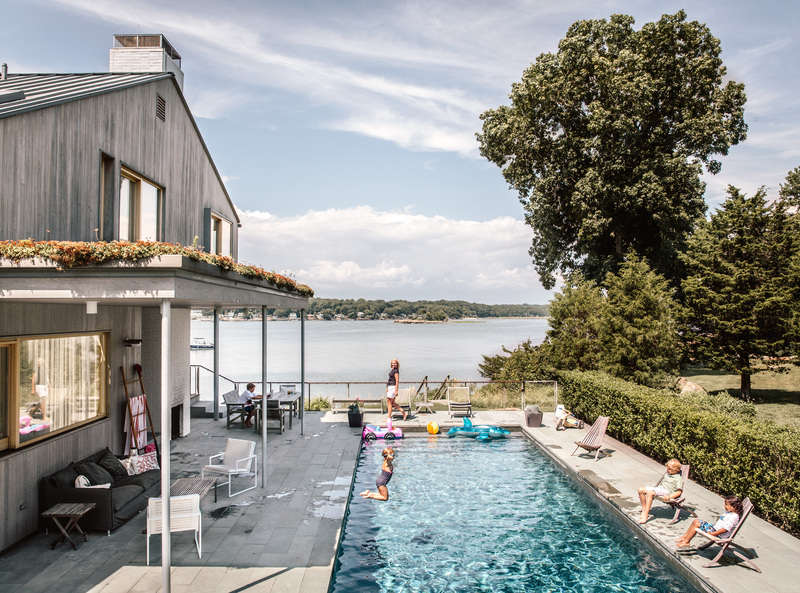 When it came to buying a vacation home for themselves and their four young children, New Yorkers Catherine Greenman and Richard D’Albert didn’t have to waste time scouting locations. Greenman, a former science and technology writer for The New York Times and now an author of novels (Hooked was published in 2011; a second one is in the works), grew up around Guilford, Connecticut, a small seaside town on Long Island Sound, just a short drive from New Haven. Her grandparents bought a house in Guilford in 1945 (which they left to her parents), and Greenman and her brother grew up spending happy summers there. The house is located in Sachem’s Head, a tranquil and remote 600-acre peninsula just inside the town limits. Since wetlands cover some of the area, new construction is restricted, which has kept it from becoming overdeveloped. Greenman and D’Albert managed to find a for-sale property near her family’s home, in 2003. “It was one of the only houses on the market then,” says Greenman. They planned to tear it down and rebuild under the guidance of Lisa Gray and Alan Organschi, the New Haven–based duo behind Gray Organschi Architecture, whom the couple found via the Yale alumni network. They admired the architects’ work and were impressed by their modern-yet-naturalistic approach. The house in question was a run-down 1970s dwelling, put on the market by William Collins, a Yale professor and neurosurgeon who was retiring and moving to California. The late Louis Kahn, the professor’s friend and colleague, had helped with the house’s initial design but died before its completion. Kahn’s greatest contribution was the house’s siting: He’d planted its foundation on the beach, facing away from the larger horizon of the Long Island Sound and toward the jagged coastline. Because the house had been grandfathered in under old zoning laws, the architects could build where it would otherwise no longer have been allowed. The couple originally asked for a simple renovation, but as frequently happens in a remodel process, they found more structural problems and wound up with a complete teardown. 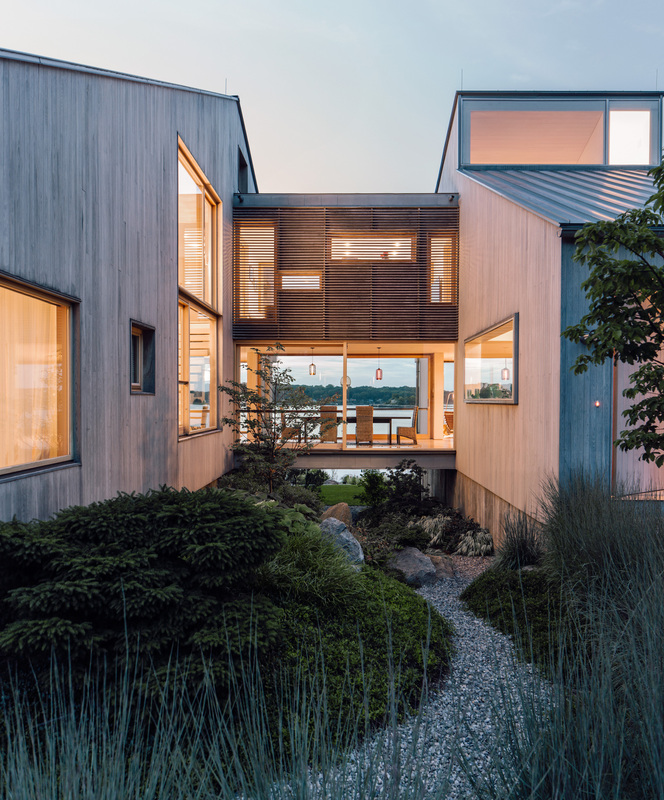 The end result: a 6,000-square-foot structure, with six bedrooms and five baths, housed in two elegantly spare bleached cedar–clad wings that are dramatically connected by a two-story bridge. One wing contains the children’s quarters and the other is for the grown-ups, ensuring privacy and quiet. Gray Organschi laid out an open plan with zoned areas, all offering wide-open views of the Long Island Sound and the surrounding landscape. On the first floor, the spaces overlap and flow into each other. The two-story bridge that connects the wings provides a stagelike setting for a dining room on the first floor, and a casual family-recreation area on the second. The kitchen is in the west wing, connected to the east-wing living room through the dining room bridge. 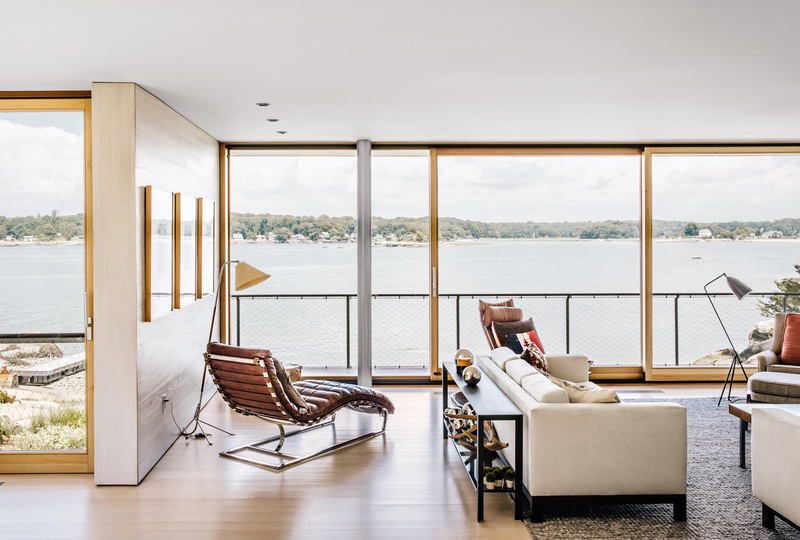 Enormous sliding-glass panels open the rooms to the outside and capture breezes during Connecticut summers. The house’s interiors are also clad in bleached cedar, with ash floors that are mostly left exposed. The kitchen features a massive island with a concrete countertop, a throwback from a loft on SoHo’s Crosby Street that the family once lived in. Greenman insisted on the material: “I love the way concrete develops imperfections over time,” she says. On a similar note, all the furnishings “are an amalgam of all the spaces in which we’ve lived,” Greenman says. Objects with high and low price tags mingle. She found side tables for the master bedroom at CB2 and installed two chairs in the guest room that were salvaged from a curb in Tribeca. She purchased several antiques from Duane Modern and the chaise in the living room from Restoration Hardware. Shopping on 1stdibs netted her a collection of Hans Wegner’s iconic Wishbone chairs, and she scored Frank Gehry’s Cross Check and Hat Trick chairs from an estate sale nearby. The staircases to the second floor—one for each wing—are similar, though not identical. For the east wing, leading up to the master bedroom, the waterfall staircase is ash on a single ash stringer. The west wing staircase, leading to the kids’ bedrooms, is fitted with open risers, chosen to let in the maximum amount of light. “They’re solid, not scary,” says architect Lisa Gray. The treads are made of laminated ash, cut to specifications with a CNC machine. Gray explains that they can be manufactured off-site then installed onto the mill-finished steel stringer, saving time onsite.